Radeon Developer Mode Driver – This is shipped as part of the AMD public driver and supports the developer mode features required for profiling and debugging. Radeon Developer Service (RDS) – A system tray application that unlocks the Developer Mode Driver features and supports communications with high level tools. Radeon Developer Service - CLI (Headless RDS) – A console (i.e. non-GUI) application that unlocks the Developer Mode Driver features and supports communication with high level tools. Radeon Developer Panel (RDP) – A GUI application that allows the developer to configure driver settings and generate profiles from DirectX12, Vulkan and OpenCL applications. 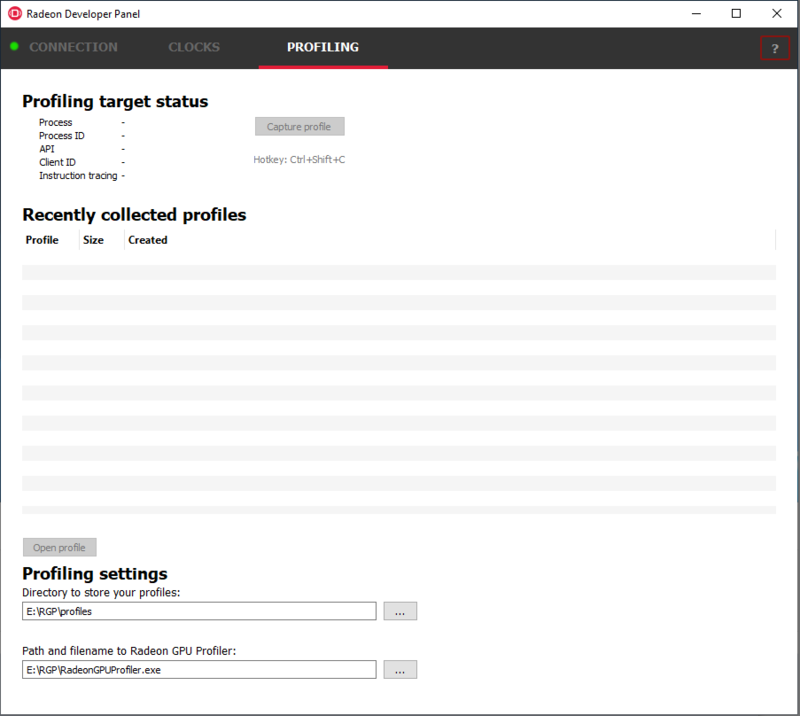 Radeon GPU Profiler (RGP) – A GUI tool used to visualize and analyze the profile data. This document describes how the Radeon Developer Panel can be used to profile frame-based applications on AMD GCN graphics hardware. 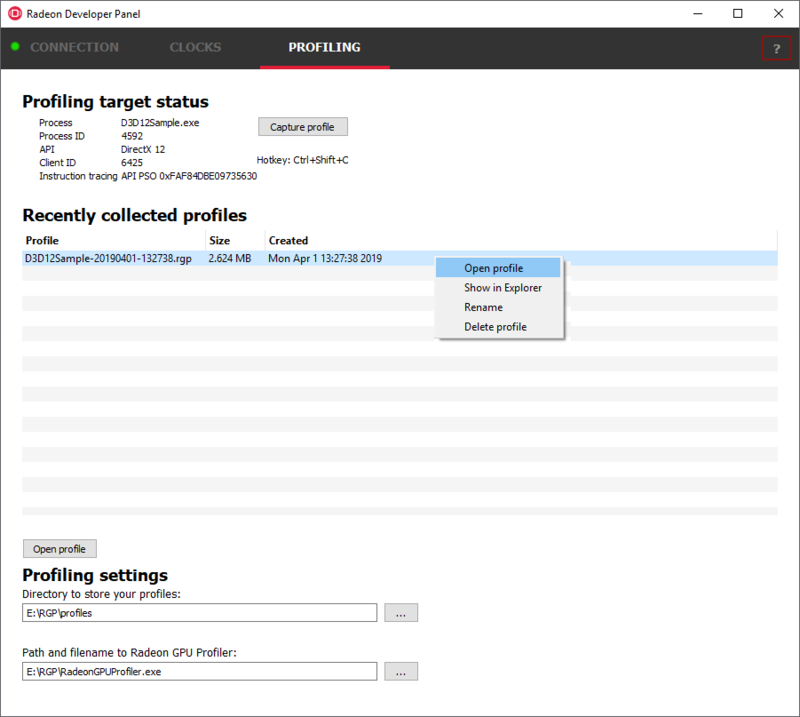 The Radeon Developer Panel connects to the Radeon Developer Service in order to collect a profile. Note: By default, the driver allocates a maximum of 128 MB video memory per Shader Engine to capture RGP profiles. After installing the latest video driver, make sure that the current user is a member of the graphics group. This can be done by typing: “sudo usermod -a -G video $LOGNAME” Where $LOGNAME is the user name. Log out and log back in again for this to take effect. Install the vulkan shared library by typing “sudo apt-get install libvulkan1” or by downloading the Vulkan SDK from the LunarG website. IMPORTANT: The application you want to profile must NOT already be running. The panel needs to be configured in advance of starting your application. Start the RadeonDeveloperPanel.exe on your local system. The panel will startup up with the Connection tab already highlighted (see below). Select the localhost entry in the “Recent connections” list, then click the “Connect” button. This will start the Radeon Developer Service on the local system and establish a connection. Double-click on any Recent connection, and RDP will attempt to establish a connection to RDS running on the given host. Note that the red dot to left of the “CONNECTION” tab should change to green to indicate that the connection was successful. You may get a “Failed to connect to RDS” pop up message when running the panel for the very first time. If the Radeon Developer Service is not running, the panel will try to start the service automatically for local connections and this can fail due to Windows file permissions (the Radeon Developer Service will not be a known application to Windows and the program will not be permitted to start). If you see this message try manually starting the “RadeonDeveloperService.exe” and connect again. Use the “…” button to browse to the executable, or manually type it in the executable name textbox. Use the executable name textbox to enter a wildcard ‘*’ which is used as a catch-all for any target application launched. Note that Checkbox options in a row which has a wildcard for the filename take precedence over any other rows that may contain an exact filename match. Select an active process within the Active Applications table, and click the “Add to targets” button. The process will need to be restarted in order to apply settings at application startup, and to enable collection of RGP profiles. Click the “Add to list” button to add the new executable to the list of processes that will start in Developer Mode. The “Enable profiling” check box should be checked automatically for the application you just added to the list. The driver will render an overlay on top of the application’s render window if all is working correctly. The overlay will indicate if Profiling is enabled for the application, and will display the Client Id that RDP uses to communicate with the process. The panel will detect when your application has started, and will switch to the Profiling tab. Click the “Capture profile” button or press the Ctrl + Shift + C hotkey to generate an RGP profile. The hotkey can be useful when capturing profiles from applications running full screen or when an app requires focus when rendering. After a few seconds a new profile should appear in the list below. Note: Certain anti-virus software may block the hotkey feature from monitoring key presses. Right-clicking on a row in the list of recent profiles will open a context menu for the selected file. The context menu allows you to quickly navigate to the profile location in the filesystem, and rename or delete the file. To open a profile file in the Radeon GPU Profiler, select the profile in the list and click the “Open profile” button or double-click the selected row. The API combobox is used to select which profiling option(s) are displayed for a supported API. Profile settings can be configured for each API type. The dialog box will show the default profile options for the target application and API selected. The Auto detect API only supports the Trigger mechanism at this time. 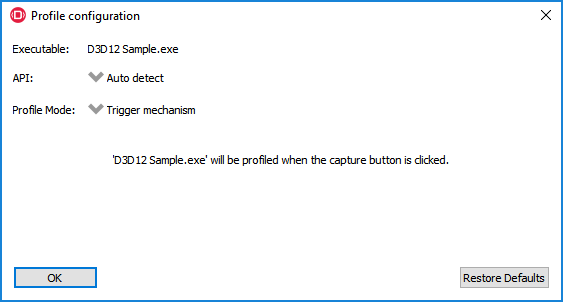 This Profile mode is the the manual method of profiling described using the capture button or hotkey in the previous sections. 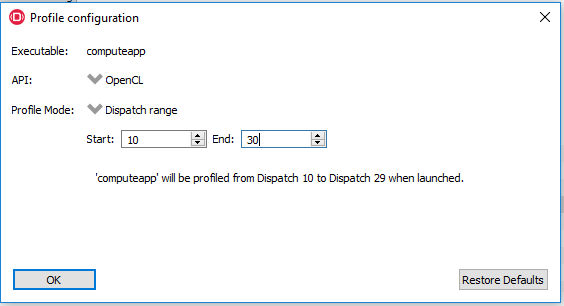 Select OpenCL for the API and choose Dispatch range for the Profile mode. Selecting this will display start and end Dispatch edit boxes. For example, the values 5 and 20 could be entered and the profile would consist of 15 Dispatches starting with the 5th Dispatch. The 20th dispatch is not included in the trace. The number of dispatches captured is limited to 50 at present to prevent the amount of captured data becoming too large. Once the profile mode has been selected for the target application, click the OK button to close the dlaiog. Start the target application in the normal way. Be aware that a row in the target applications table with a wildcard will take precedence over an exactly matching filename. The profile configuration options for the wildcard row will be applied in this case. Note: Only recent drivers support these new profile modes. If the driver doesn’t support a particular profile mode, a warning message will be displayed and profiling for that run of the application will be disabled. The default Trigger mechanism profile mode should always work. Some applications capture focus or run fullscreen which makes capturing a profile difficult. The RadeonDeveloperPanel provides a hotkey to allow capturing using the keyboard. Presently, this is Shift-Ctrl-C. On Linux, the hotkey is only available when starting the Panel with elevated privileges (ie sudo RadeoDeveloperPanel). Root privileges are needed in order to read the keyboard device, which by default is found in the path ‘/dev/input/by-path’, and is a file ending with ‘event-kbd’. If this path doesn’t exist or the keyboard device has a different name, copy the KeyboardDevice.txt file from the docs directory to the root folder where these tools are located and edit this file so it contains the full path and file name of the keyboard device on your system. There are two variations of the Radeon Developer Service: The GUI based RadeonDeveloperService and the RadeonDeveloperServiceCLI (command line interface). For headless operating systems which do not support a graphical user interface, the RadeonDeveloperServiceCLI executable can be started from a terminal console window. Start the RadeonDeveloperService or RadeonDeveloperServiceCLI executable on the remote system. NOTE: RadeonDeveloperServiceCLI is a command line version of the Radeon Developer Service that has no UI components and is designed to run from the command line. Please note that no system tray icon will appear when the command line version of the service is running. Start the RadeonDeveloperPanel executable on your local system. The panel will start up with the Connection tab already highlighted (see below). 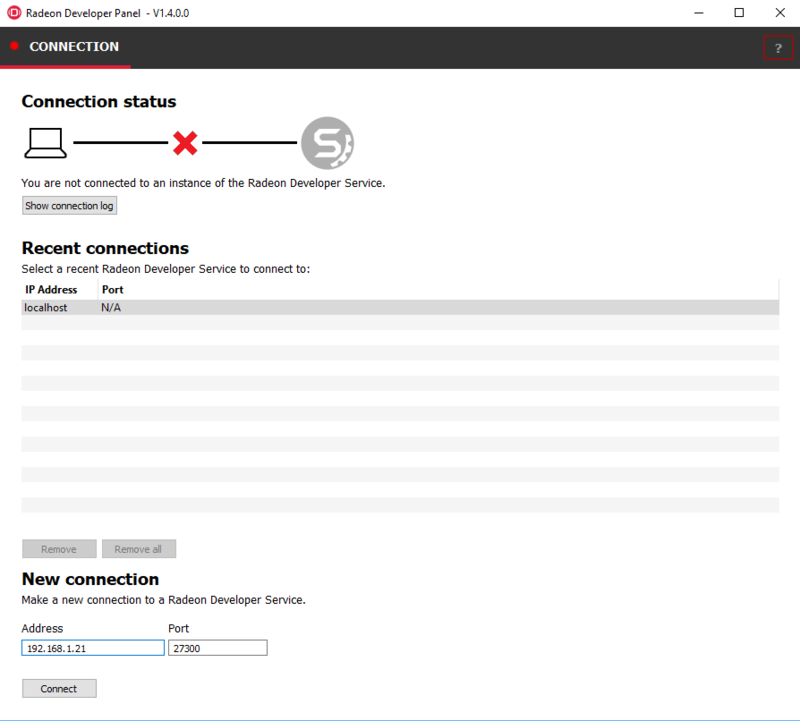 In the New connection section, fill in the Address text box with the IP address of the remote system running the Radeon Developer Service. Click the “Connect new” button. This will establish a connection to the remote system. The red dot to left of the “CONNECTION” tab should change to green to indicate that the connection was successful. Go to step 3 in “Profiling on a local system” above and continue. NOTE: Currently, the driver settings are only implemented for DirectX12. Vulkan driver settings will be available soon. The Radeon developer Panel (RDP) allows the developer to modify driver settings to experiment with features that may affect performance and quality. When you run RDP for the first time the driver settings are empty in the tool and you will need to run your application with the panel once to retrieve the driver settings. This is a one-time setup process. The important thing to remember is that when you change settings they will only be applied the next time you start the application. Changes to the settings do not effect a currently running application. To get started with settings configure your connection, connect, and setup your application as shown below. Start your application and let it run for a short while (few seconds) then terminate the process. This will populate the driver settings in the tool. Currently, there are two categories of settings (Debug and General), and there are only 4 settings in total. Many more will be made available soon. The General settings are shown below. Click on the small arrow to the right of the setting name to see the possible values and descriptions. The “Default All” button will reset the values back to the original driver settings. Settings can also be exported and imported. Make the changes you require to the settings and then click on the Connection tab. Make sure you have selected the “Apply settings” checkbox on the application you wish to change the settings for. Start your application, the settings are applied by the panel as your application starts. Profile your application as described in the “How to profile your application” section above. 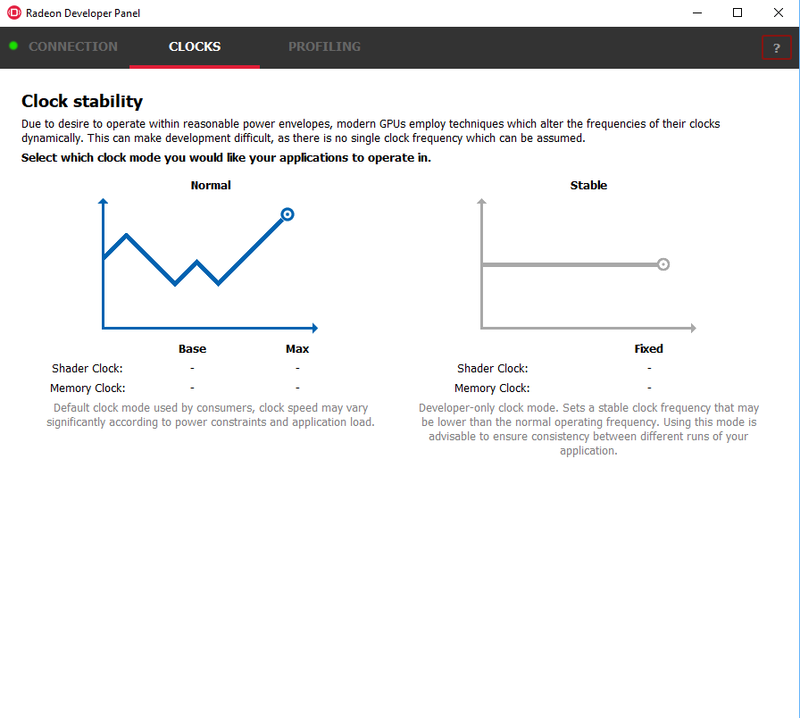 The Radeon developer Panel (RDP) allows the developer to select from a number of clock modes. Normal clock mode will run the GPU as it would normally run your application. To ensure that the GPU runs within its designed power and temperature envelopes, it dynamically adjusts the internal clock frequency. This means that profiles taken of the same application may differ significantly, making side-by-side comparisons impossible. 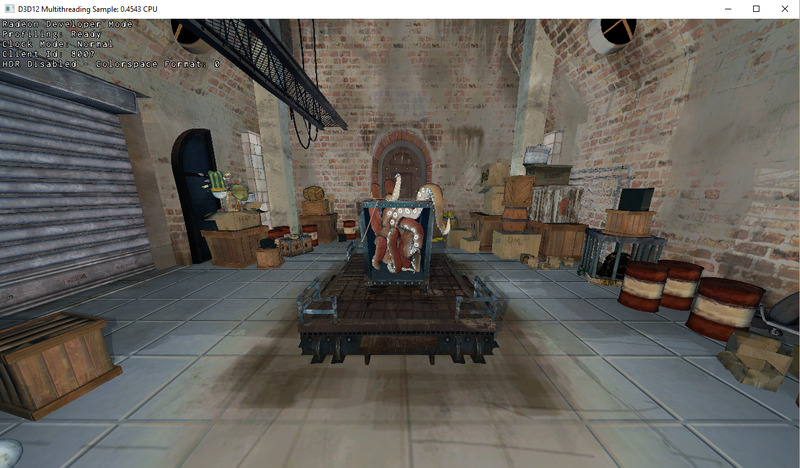 Stable clock mode will run the GPU at a lower, fixed clock rate. Even though the application may run slower than normal, it will be much easier to compare profiles of the same application. For the Radeon GPU Profiler tool, the clock settings here are not used since the driver forces a profile to take place using peak clocks. Click on the “Show connection log” button from the CONNECTION tab to see any logging information that is produced by the the panel activity. Additional information about the connection and any errors encountered by RDP and the RDS are displayed here. Below is an example of typical output from a session that captured a profile. The log can be saved, cleared and copied to the clipboard using the buttons at the bottom. Two version of the Radeon developer service are provided, one with a configuration UI and system tray icon, and one designed for use with headless GPU system where no UI can be supported. RadeonDeveloperService(.exe) – Can be used for general use where the system has a monitor and UI (e.g. desktop development machines). 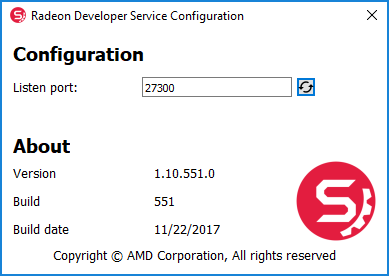 The Radeon Developer Service includes a configuration window containing basic service configuration settings and software info. Double click the Radeon Developer Service system tray icon to open the configuration window, or right-click on the system tray icon and select ‘configure’ from the context menu. Listen port – The port that the Radeon Developer Service uses to listen for incoming connections from a remote Radeon Developer Panel. The default port is 27300. Altering the port will disconnect all existing sessions. The circular arrows icon to the right of the Listen port field can be clicked to reset the port to the default value. Version info – Software version information for the Radeon Developer Service. Double click the Radeon Developer Service system tray icon again or right-click on the system tray icon and select ‘configure’ from the context menu to close the configuration window. Please note that when running both the Radeon Developer Panel and the Radeon Developer Service on the same system the communication between the two uses pipes, not sockets and ports, so setting the port has no effect. RadeonDeveloperServiceCLI(.exe) – Command line version for use with headless GPU systems where no UI can be provided. NOTE: This version can also run on a system that has a monitor and UI. – port <port number> Overrides the default listener port used by the service (27300 is the default). Please note that the service will need to be explicitly started before starting the Radeon Developer Panel. If the service isn’t running, the Radeon Developer Panel will automatically start the UI version of the Radeon Developer Service, which may not be what is required. If the RadeonDeveloperServiceCLI executable crashes on Linux, shared memory may need to be cleaned up by running the RemoveSharedMemory.sh script located in the script folder of the RGP release kit. Run the script with elevated privileges using sudo. If this fails to work, try starting the panel with elevated privileges. “Connection Failure” error message. This issue is sometimes seen when running the panel for the very first time. The panel tries to start the service automatically for local connections and this can fail. If you see this message try manually starting the “RadeonDeveloperService.exe” and connect again. Allow the RDS firewall exception to be created within the Windows Firewall when RDS is first started. 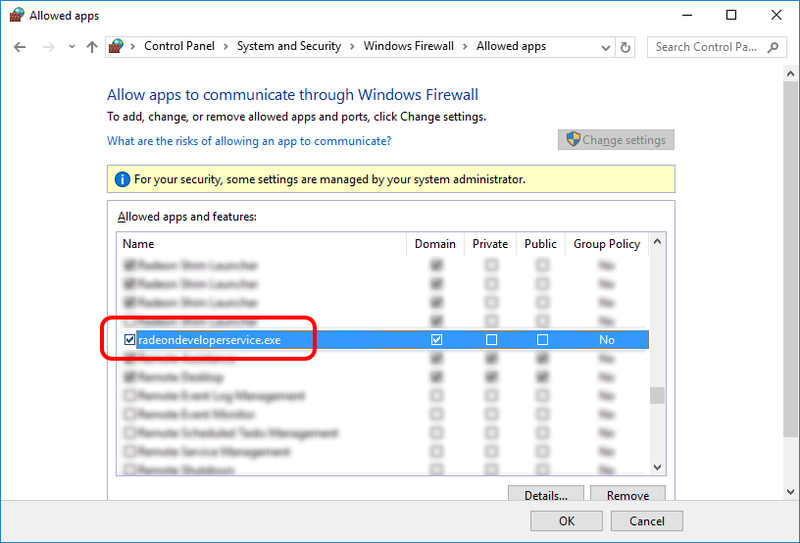 Within the Windows Security Alert popup, enable the checkboxes that apply for your network configuration, and click “Allow access”. 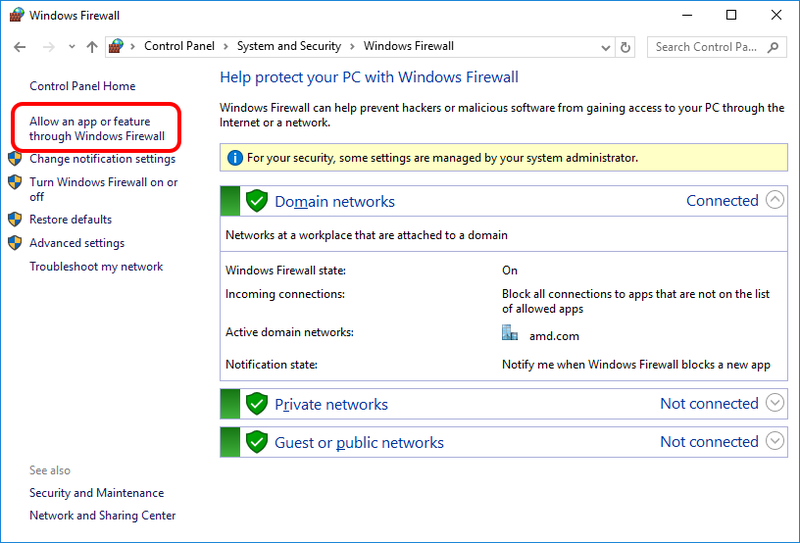 Alternatively, disable the Windows Firewall entirely will also allow RDS to be connected to. 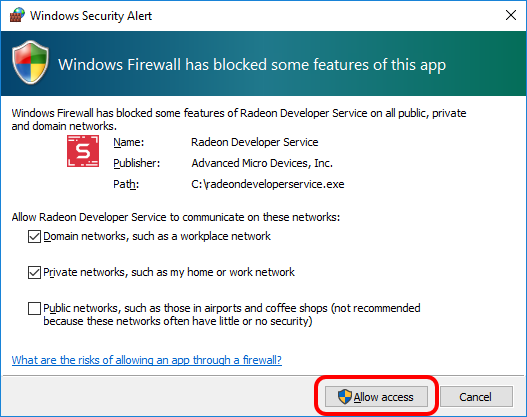 NOTE The Windows firewall alert in no way indicates that the Radeon Developer tools are trying to communicate to an AMD server over the internet. The Radeon Developer tools do not attempt to connect to a remote AMD server of any description and do not send personal or system information over remote connections. The Radeon Developer Panel needs to communicate with the Radeon Developer Service, which may or may not be on the same machine, and a connection needs to be made between the two (normally via a socket). If the remote machine is running Linux and the “Connection Failure” error message is displayed, the Linux firewall may need to be disabled. This is done by typing “sudo ufw disable” in a terminal. The firewall can be re-enabled after capturing by typing “sudo ufw enable”. Adjusting the GPU clock mode on Linux is accomplished by writing to /sys/class/drm/card<n>/device/power_dpm_force_performance_level, where <n> is the index of the card in question. By default this file is only modifiable by root, so the application being profiled would have to be run as root in order for it to modify the clock mode. It is possible to modify the permissions for the file instead so that it can be written by unprivileged users. The Radeon GPU Profiler package includes the “scripts/EnableSetClockMode.sh” script which will allow setting GPU clock mode in cases where the target application is not, or cannot, run as root. Execute this script before running the Radeon Developer Service and target application, and the GPU clock mode can be updated correctly at runtime. This script needs to be run each time you reboot your machine; the file permissions do not survive system reboots. As previously mentioned, the panel only needs to be run with elevated privileges if the keyboard shortcut is needed for capturing. On Ubuntu 18.04, a dialog box may pop up indicating that the RadeonDeveloperService is running in headless mode. This is nothing to worry about and will not affect profiling in any way; it just means that the root shell doesn’t have access to the system tray so is running without a user interface. The only downside is that there won’t be a ‘service’ icon available on the desktop. The Radeon Developer Panel may fail to start the Radeon Developer Service when the Connect button is clicked. 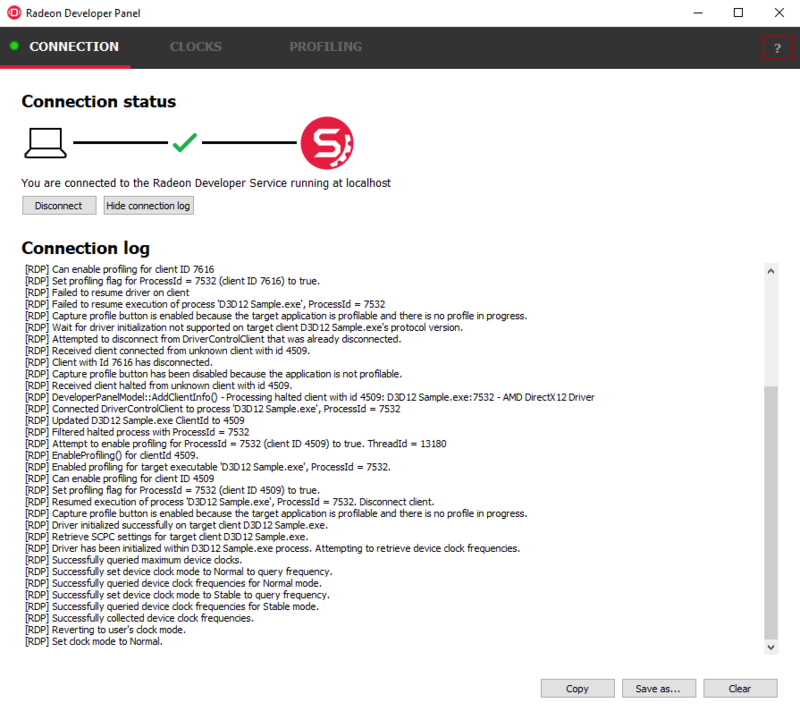 If this occurs, manually start the Radeon Developer Service, select localhost from the the Recent connections list and click the Connect button again. 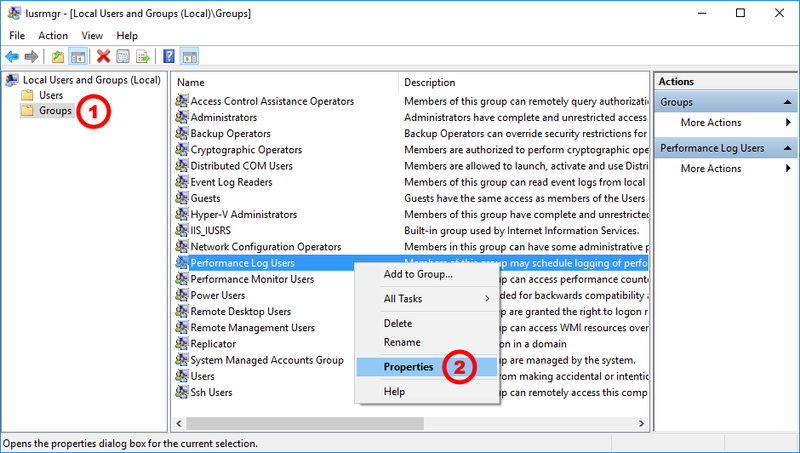 To collect complete profile datasets for DirectX 12 applications, the user account in Windows needs to be associated with the “Performance Log Users” group. If these privileges aren’t configured properly, profiles collected under the user’s account may not include all timing data for GPU Sync objects. Open the Run dialog by using the Windows Start menu, or through the Windows + R shortcut. 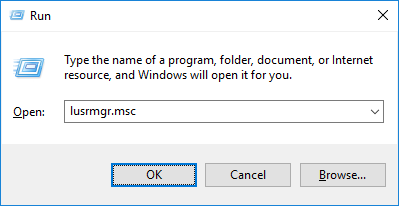 Type “lusrmgr.msc” into the Run window, and click OK. 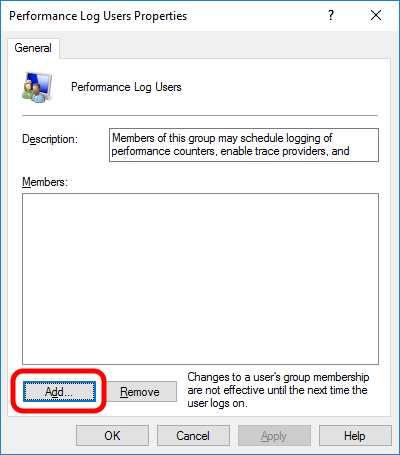 Within the “Local Users and Groups” configuration window that opens, select the Groups node. Select the Performance Log Users entry. Right-click and select Properties. 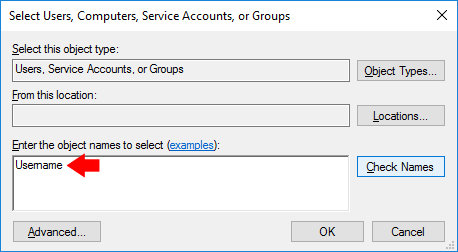 Type the active user’s account name into the Select Users, Computers, Service Accounts, or Groups dialog, and click OK. When the user has been added to the group, restart the machine and log back in. RDS should now be configured to collect full timing information for DirectX 12 applications. Please note that when running both the Radeon Developer Panel and the Radeon Developer Service on the same system the communication between the two uses pipes, not sockets and ports, so setting the port has no effect. In this scenario, it is possible to set the service to listen on a no-default port, leave the panel on the default port, and connection will work fine. The presence of non-AMD GPU’s and CPU’s on your system can cause the failure to generate a profile or apps to not run at all. Vulkan applications, by default, use GPU 0 which usually maps to the integrated GPU, or in some cases, the non-AMD discreete GPU. In both cases Vulkan apps will either fail to run, or RGP profiling will not work (no RGP overlay will be present in these cases). Disable any non-AMD discrete GPU’s in the device manager, and/or physically remove from the system. © Copyright 2017, 2018, AMD Developer Tools Revision a361ba6e.